Not sure what WordPress has done to this pic to make it look soft in the small version, but if you click on the photo and view the large version its sharp. Ok, all jokes Tasmanian jokes aside, Tasmania rocks! I am definitely going back again this year to cover it in more detail. I could’ve spent days in Hobart itself just taking photos alone. This was the view that I was presented with my first morning in Tasmania and I was just blown away by it. I was hoping for mirror like reflections in the water and to have Mount Wellington light up like it did was just a bonus. This particular morning I also managed to get over to Salmanca Place and captured some pretty cool shots from there with Mount Wellington in the background as well. Tasmania, a landscape photographers dream. Hopefully Tim from Island Images will approve of this shot. The roads are so steep and have so many corners that I think if I moved to Tassie I’d buy a WRX or EVO just to deal with the corners. To give you an idea of how hard it is to get around on the West Coast, it took us almost 3hrs to travel 70kms around the Queenstown area. Has anyone else considered a trip to Tassie and what areas did you think of shooting? 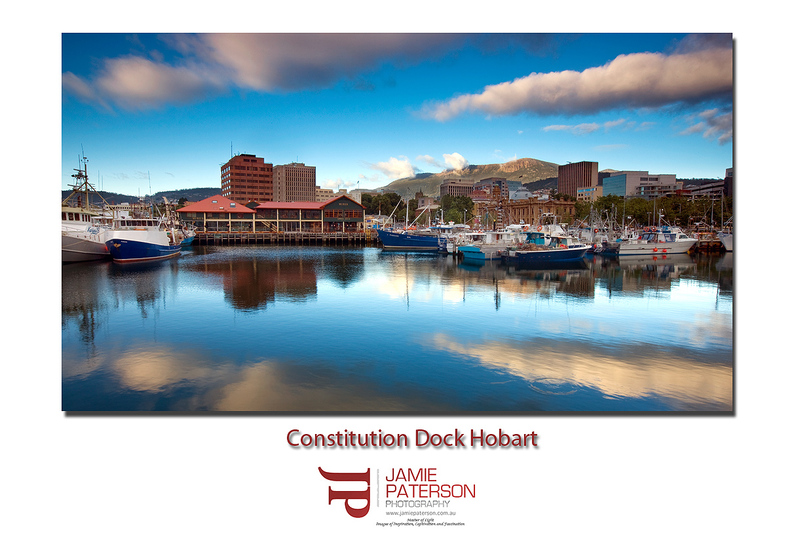 This entry was posted in australian landscape photography, tasmania and tagged australian sunrise, boats, constitution dock, fishing boats, hobart, hobart sunrise, morning, Mount Wellington, sullivans cove, tasmania. Thanks mate. Yes I have to admit I was pretty stoked when I saw Mount Wellington light up like that. In fact it ‘played the game’ the whole time I was there. That is really cool information about the family history down there. If you’re heading to Cradle Mountain make sure you head to Mount Roland as well, its just as if not more spectacular. I was born there, but moved to WA when I was 4. Last year was the first time I went back to Tassie, and we spent a week visiting some great locations. Cradle Mountain and Dove Lake are worth a visit, and there are some great places along the east coast, such as Freycinet National Park, Bay of Fires, and more. There are plenty of great waterfalls too! Port Arthur is fascinating, and when in the area, be sure to check out the Tesselated Pavement, Devils Kitchen, and more. I’d love to explore the west coast sometime too! Thanks for stopping by and commenting. I spent most of my time just doing a recon trip this time around in Tassie, but on my next trip I’ll definitely be hitting the Tesselated Pavement, but will be spending at least four days in the Cradle Mountain area. Thanks for that mate. I must agree with you, I was like the others. Thought I could cover all of Tassie in a week. I reckon you need a week just to properly cover a few parts of Cradle Mountain National Park. We are looking at going back and spending around four weeks driving around. Went to Tassie quite a few years ago and loved it certainly going back there ASAP. Tasmania is as close to being in NZ as you can get , they similar in a lot of ways. I’ve been four times but this was my first as a photographer. Its certainly a majical place. My suggestion would be to go mid spring when all the rivers are flowing. A number of the waterfalls aren’t exactly dry at the moment but they aren’t really impressive either at this time of year. Russell Falls which are a three tierd waterfall only had a very small amount of water dropping down. that’s awesome, the sky is replicated so well on the water! That is what I loved the most about this photo. The reflections in the water! Lovely scene, Jamie, nicely composed. Did you make the drop/splash in the foreground there? It is a nice addition to an already nice photo. No that splash was naturally there. Nothing to do with me. Thank you very much for the compliments as well. I appreciate them. Great clouds in this shot Jamie….really nice composition. Thanks for stopping by and thanks for the comment. Its hard to get a bad shot in Tassie!